By using Food Guides you can be one step closer to finding your own healthy lifestyle. Food guides are basic nutritional education tools that are designed to help people make food choices that are healthy, and will prevent a number of diet-related diseases. They represent sophisticated dietary analysis, and merge national nutrition goals, data from food consumption surveys, and issues of food supply and production. It organizes foods into categories or food groups that are similar in nutrient content. 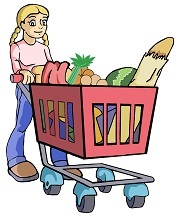 A food guide provides recommendations on what food groups to choose from and the number of servings of food from each group in order to get a nutritionally adequate and wholesome diet. Although I talk about the CANADIAN FOOD GUIDE, there are food guides available from other countries as well, but the reality is people are people and I love the way the New Canada food guide is laid out and is the most up to date. Canada’s first food guide, was introduced in July 1942. This guide acknowledged wartime food rationing, while trying to prevent nutritional deficiencies and to improve the health of Canadians. Since 1942, the food guide has been updated many times and it has adopted new names, new looks, and new messages, yet has never wavered from its original purpose of guiding food selection and promoting nutritional health. The last major revision to Canada’s Food Guide came out in 1992 — long before there were concerns about Trans fats, omega-3 fatty acids and growing rates of obesity. There was a need to update the food guide based on a study that was released, which collected information from over 130,000 people aged 12 and older. The results from this survey were not good. The survey found that between 1994 and 2001, the number of obese Canadians aged 20 to 64 grew by 24 per cent to almost 2.8 million. Increases in obesity rates were greatest among men and women aged between 45 and 54, who accounted for a quarter of all obese adults in Canada. The same results were also found in other parts of North America. 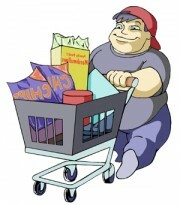 Among children, nine per cent were considered obese.Another 20 per cent were considered overweight. The survey also found that children and adolescents who reported eating fruits and vegetables five or more times a day were substantially less likely to be overweight or obese than those who consumed them less frequently. Forty-one per cent of children and adolescents reported they ate at least five servings of fruit and vegetables a day. Two years after that study was released, Health Canada announced that the Food Guide would receive a makeover to address changes in eating patterns, food supply and diets, as well as advances in nutritional science. And the result of this overhaul is the NEW Canadian food guide. It is becoming increasingly complex for people to understand what is healthy eating, so what the food Guide tries to do is define healthy eating. It contains information that is more targeted to specific groups — children, teens, women, men and the elderly. And, for the first time, serving sizes for preschoolers are included as well. Also for the first time, adults over 50 are being advised to take a vitamin D supplement every day, to help reduce the risk of osteoporosis. But guides are just guides and are not and should not be considered gospel. Case in point, new research into vitamin D makes the sunshine vitamin an even brighter light in cancer prevention. Two studies have found that increasing daily intake of vitamin D could prevent the development of breast cancer by as much as half and that of colorectal cancer by nearly two thirds. Based on these findings, researchers recommend taking 2,000 IU of vitamin D daily, on top of spending between 10 and 15 minutes in the sun each day, weather permitting. If you look at Canada’s revised Food Guide it recommends only 400 IU daily but there is really no downside to taking 2,000 IU of vitamin D.
Currently in North America the average person gets less than 200 IU of vitamin D a day. Therefore supplements are the only way to take in the studies recommended amounts especially where people must cover up during the cold winter months. The guide doesn’t just say which foods are good and which are bad; it says how much food is enough and how much is too much. The guide now recommends that you eat foods with little or no added salt, though it’s not clear whether a low-salt diet provides added benefits for healthy people. It also recommends that people strive to get their fruit and vegetable servings from fresh fruits and vegetables instead of juice, as much as possible. It also recommends that you include some fats and oils in your diet, with the focus on unsaturated fats such as olive and canola oils. The guide also recommends that you limit as much as possible the consumption of trans fats. The guide contains more specific information on what constitutes a serving. An apple, for instance, equals one Vegetable and Fruits Food Guide serving. If you’re having a stir-fry for dinner, one cup of mixed broccoli, carrot and sweet red pepper would give you two Vegetables and Fruit Food Guide servings, and 75 grams of chicken (or game meats such as deer, moose, caribou or elk) would constitute a Meat and Alternatives serving. One cup of milk or fortified soy beverage makes one Food Guide serving. If you’re between age nine and 18, you’ll need three to four servings every day to make up your Food Guide requirements. Food guides are not a weight-loss tool or a diet system, but if you combine its use with physical activity, it may help you to reach your fitness goal. It is important for everyone – young and old – to balance healthy eating and daily physical exercise. The key to reducing your risk of Type 2 diabetes is to move more and eat less. The new food guide incorporates the best and the most current information that nutritional science has to offer. The overhauled guide advises you to focus on vegetables, fruits and whole grains and to limit foods that are high in calories, fat, sugar and salt. Most of what you eat these days in North America has little if any connection to your local environment. By one estimate, food consumed travels an average of 1,300 miles from point of production through processing to point of consumption. Today, no region is self-sufficient in food production, and consumers have come to depend upon many imported products that can be produced only in climates and soils outside their regions. Despite population growth the number of farms and total land area in farming has declined steadily since the turn of the century. Most farms are now highly specialized, many producing only one or two commodities. Early in the century, most farms had diversified operations, and there were many more farms producing any given crop. For example, in 1910, over 85% of all New York farms grew potatoes and 79% grew vegetables. In 1992, fewer than 2% of New York farms grew potatoes and only 9% sold vegetables. Not only are fewer farms producing any given crop, but overall production of crops that are grown has declined. Similar trends can also be found in food processing. The disappearance of local agriculture has severed the once strong links between farmers and consumers who at one time essentially were neighbors. Commodities grown anywhere in the world are now brought year-round by refrigeration and rapid transport to consumers anywhere in the world who can afford them. Nearly half the fresh fruits and vegetables consumed domestically are produced in California. Often, food products are imported into states where they also are locally produced. For example, less than 4 % of all the apples produced in New York State go to the New York City fresh and processed apple market, which is now primarily served by other states and countries. Consumers participate more and more in the global food system and allow the local food system to decline. You may wonder what this has to do with food guides but it does because sometimes when you buy fruits or vegetables in your local store, they have often traveled long distances to get there and the nutritional benefit you may think you are receiving has declined compared to what you could have gotten from your local farmers field. Your goal should be to promote a diet that supports local agriculture and to minimize, not add to, the costs involved to maintain your food supply. While total self-sufficiency may not be a socially, economically or ecologically possible, it is perhaps useful to explore the best “mix” of global, regional and local foods when deciding what next to eat. I know you want to get in shape and look great. Whatever your fitness goal…to slim down…gain muscle…tone your arms or flatten your tummy…I’m here to help you accomplish your goals and to improve your fitness level. You will learn how to select and combine your diet with exercise, so that you can be the best you can be.